A woman managed to escape a gym car park after a man tried to open two of her car doors. Nadia White from Glinton was able to lock her car just in time before driving off after the frightening experience. The 34-year-old was sat in Sainsbury’s car park in Bretton at 8pm last Thursday, having used the YMCA gym at The Cresset, when a man described as white, with facial hair and wearing a red ‘Puffa’ style jacket and dark woolly hat tried two of her car doors. Nadia said: “I saw a man coming and put the central locking on. “He tried to open the driver’s door which was quite scary. I grabbed the keys and started the engine and he tried the rear door. Nadia twice rang 999, the second time after a relative saw the man with another man at the Bretton Centre. She called 999 a third time after her relative said the officers had not approached the men, but she claims she was told not to ring the emergency number again. Nadia, who works for Leicestershire Fire and Rescue Service, said she has now lost faith in the police. A police spokeswoman said officers at the scene established what had happened then went to find the men. 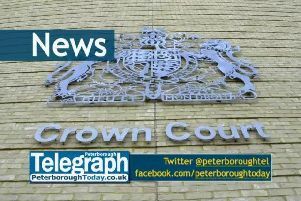 She said: “Officers went to speak to the men for being drunk and disorderly and ask them to leave the area. “The officers updated the people at the scene on the action they were taking.